Is rawhide harmful to your dog? Re: Is rawhide harmful to your dog? got sample and let us see?? cos as far as i know (a dog owner for few months)i never come across those rawhide can cut de wor...u used scissors ar? so dem hard!!! u are referring to those FLAVOR MEAT BONE ? this one got inner parts? and many layer??? 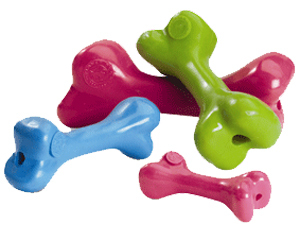 Watching your dog play with this flexible and durable curiosity you'll wonder why we didn't call it Funny Bone. Some even call it a doggie-pacifier. Non-toxic, recyclable and rinses clean. Made in the U.S.A.
is this same like nylon bone? but we should discuss more details about rawhide here. Can you like at least tell us what is bad about rawhide? agnes, what kinda scissor ur use to cut rawhide?i tried just now, i cant even cut amos's milk bone. this not like nylon bone, it very soft and have a great Peppermint . rawhide for dogs use chemical preservatives and color chemical preservatives in processing.These chemicals can be toxic to dogs, inner layer of the hide usually from a cow, the rawhide no good, it dirty after wet. It is important for a dog not to be able to chew off and swallow large pieces as this may cause vomiting or diarrhea and It can cause blockages & choking. i feed milk bone, white color 1.
and i always think this treats looks like 'kayu'. Any idea what is it made from? eh...i know it's not tis type...but it's one stick like this lor? The KAYU one always made by wheat will have chemical preservatives and color chemical preservatives. It not made by inner layer of the hide usually from a cow. how come no mention ingredient?!?! Another china product?!?? clement, so the big bone rawhide also not good ah? come lah bring cooper come find me, i give cooper try. sure he love it. cooper: yes! got new food! it's treats. sure cooper kiss me even more. back to rawhide topic. how old can a puppy/dog to consume rawhide?